In softball, the distance between the pitcher's mound and home plate varies. The distance is often shorter in fast-pitch softball, where the ball is pitched fast with little arc, and in leagues for children, who may struggle with longer distances. Slow-pitch games, where the ball is pitched slower and with more arc, use longer distances. If you need to modify the distance, you can use chalk to draw a line closer to home plate. A shorter distance between home plate and the pitcher's mound suits kids best. Many kids simply aren't strong enough to deliver an effective pitch from long distance. 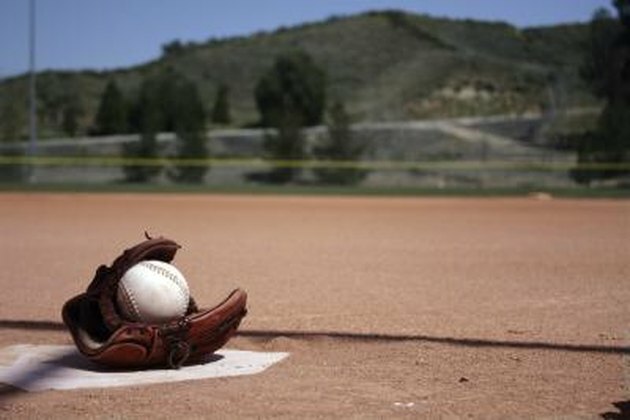 The International Softball Federation suggests that children 12 and under use a plate-to-mound distance of 35 feet. For ages 12 to 14, the plate should be 40 feet from the pitcher's mound. Kids 8 and under usually play T-ball. In an adult slow-pitch game, regardless of whether it's a men's, women's or co-ed league, the distance between home plate and the pitcher's mound should be 50 feet. This allows for higher-arching pitches, which are slower and easier to hit than fast-pitch. The suggested distance for a fast-pitch game for adult men is 46 feet. Fast-pitch games for adult women usually have a mound-to-plate path of 43 feet. Youth softball covers ages 15 to 19. In a fast-pitch game with girls 19 and under, the distance between the mound and home should be 43 feet. Fast-pitch softball for girls 16 and under usually is 40 feet. In a youth girls' slow-pitch game for ages 19 and under, the distance between home and the pitcher's mound should be 50 feet. For youth girls 16 and under, the distance is 46 feet. Youth boys' softball has distances similar to those for youth girls. In a youth boys' 19-and-under slow-pitch game, the distance should be 50 feet. For boys 16 and under, it should measure 46 feet. In the fast-pitch game for youth boys 16 to 19, the distance is 46 feet.